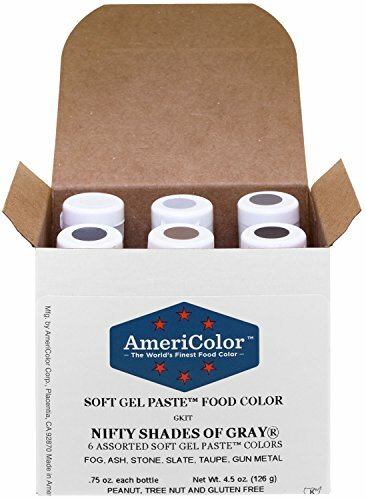 These highly concentrated soft gel food colors are formulated with the necessary die concentration levels needed to achieve the most vibrant and brilliant shades of gray. Soft Gel Paste colors have a viscosity that offers the convenience of a pourable gel, making it easier to measure amounts or duplicate shades. Only a small amount is needed to tint icing, fondant, marzipan, gum paste, or dough without affecting the consistency and it will not break down buttercream or non-dairy icings like liquid colors. 6 Color Kit Composed of: Fog, Ash, Stone, Slate, Taupe, and Gun Metal. Size: ¾ oz each bottle Product Made In The United States Ingredients: Water, sugar, colors (one or more of red #40, red #3, yellow #5, yellow #6, blue #1, blue #2, or titanium dioxide), modified corn starch, vegetable gum, citric acid, and less than 1/10 of 1% sodium benzoate and potassium sorbate (as preservatives) Allergens: Does not contain nut products and is not manufactured in a facility or on equipment which processes such products. Kosher Certified NOTE: Every effort has been made to reproduce the gel food color on the listings. However, the color may vary due to reproduction limitations and your monitor's color settings. 6 Variations Of Gray To Meet and Exceed All Decorating Needs! The Base Ingredients Allow The Color To Disperse Immediately So You Actually Use Less Color. AmeriColor Signature Squeeze Bottle With Flip-Top Cap. Certified Kosher And Made In The U.S.A.